Vinyl Record Collector Fair this weekend!! Record & D.I.Y. Fair, Sin É Dublin. Vinyl? Food? Bloody Mary’s? Zines? Art? DJ’s? 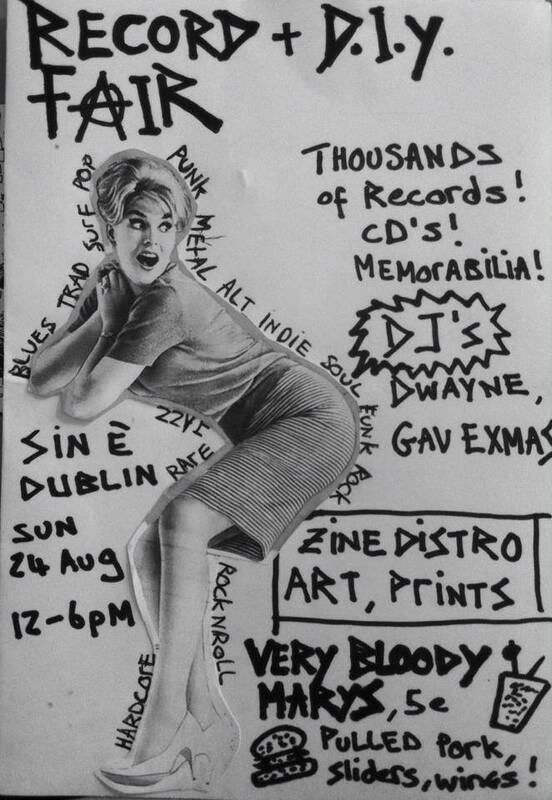 This Sunday 24th August, Sin É Dublin will be hosting all these things and more at their first Record & D.I.Y. Fair. Between 12 and 6pm, the bar will open it’s doors to the public to come and buy/ sell/ browse through thousands of records, new and old zines, and work from up-and-coming artists. The fair is part of a growing trend amongst independent Dublin businesses to use the space available to them for more than one endeavour. Examples include the Ha’Penny Market at the Grand Social, Abner Browns Barber Shop as a live music venue, and The Ink Factory working as a cafe, barber shop, and tattoo parlour all in one. These innovative ideas appeal to Dubliners, who have become much more discerning customers in recent years, and have come to appreciate our city’s talent for creativity and independent thinking. One of the main features of Sunday’s fair will be the Zine stalls. Zines can be described as “non-commercial, non-professional, small-circulation magazines whose creators also manage their production, publishing and distribution themselves”. Free from editorial constraints and outside the mainstream, zines can give a completely alternative insight into scenes and cultures both here and abroad. One of the participants in the fair will be the Forgotten Zine Archive, who recently held an exhibition of the archive in Dublin’s Centre for Creative Practices. In their own words, the 2000+ zines “preserve the parts of history that do not make it into books or blogs”. Along with members of the Dublin Zine Collective, both old and new zines will be available for those looking to add to their collections, or are looking to get their hands on some one-off works. Irish Record Fairs have been hosting and attending events all over the country, and the 24th will see some of Irelands largest dealers set up shop in Sin É. Expect hundreds of original and rare 7”s, 1000’s of LP’s, RocknRoll, Punk, Ska, Reggae, Folk, Indie, Blues, and anything in between. The last time we attended their weekend-long record fair in Filmbase, what was supposed to be a quick 10-minute browse turned into 4 hours, and us leaving loaded down with vinyl. Self confessed vinyl-junkies and DJ’s Dwayne Woods (Radiomade.ie) and Gav Xmas (Workman’s/ Garage Bar) will be on the decks for the afternoon, playing the kind of hangover set that Sundays browsing through vinyl and drinking Bloody Mary’s were made for. And of course, the bar will be open, serving up some of the best Bloody Mary’s in town, along with the kitchen that’s gonna be cooking up Buffalo Wings, Pulled Pork sandwiches, Sliders, Nachos and Fries all day. If you’re looking to do something different with your Sunday afternoon, then stop by. Pick up some zines, maybe get your hands on some super-rare vinyl, have a couple of Bloody Mary’s, and get some brunch. Kids, dogs, and bicycles are all welcome. Sin É Dublin, Upper Ormond Quay.